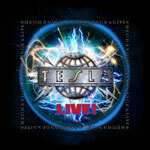 To celebrate the 30-year anniversary of the band's debut Mechanical Resonance, Tesla has recorded all of the album's 12 songs live. At this present day the band keeps going with 4/5 of this inaugural record's original performers, only missing out on guitarist Tommy Skeoch, who was replaced by Dave Rude about a decade ago. Without a doubt, most songs are indeed good enough for a live performance and some of them are truly amazing too. However, a couple of songs, like for instance Cover Queen, aren't really your first choice on a setlist, to say it nicely, and that's definitely part of the reason to why the songs aren't in the same order as on the studio version of the album and you can neither criticize their decision of ending the set with Modern Day Cowboy instead of the ballad Before My Eyes. Still I wonder why they chose to open this one with Rock Me To The Top when EZ Come EZ Go would have been a perfect start, like it is on the original record to begin with. The overall sound is just a little bit rough and pretty much what I'm looking for when I'm listening to a recording like this. Vocalist Jeff Keith is forced to put more effort than before to bring forth his tones and his voice doesn't possess the same capacity today, but at the same time his key characteristic was always to come out kind of like a little worn-out and his style is, as people who are familiar with Tesla already know, very fitting to what the band delivers as a whole unit. As a bonus feature, or for whatever reason it's there, this album ends with a studio recording called Save That Goodness, written and produced by Def Leppard's Phil Collen. I've listened to the song about 10 times and it is pretty all right, but still very far from something that I would praise as a notable point in the band's catalogue. It's a little bit too pop influenced to come out as a genuine Tesla song and I'm neither too fond of the choirs, nor the voice of the woman in the background. The band is trying hard to make it work, but in the end it lacks the original idea and the attributes that fit the band the best. Mechanical Resonance LIVE is of course most valid for people who already know the songs in the first place and since I'm one of those people I enjoy these versions very much. If you haven't listened to Tesla before, or just scarcely, I would on the other hand suggest a walk through the studio versions at first, before you make an effort to try to appreciate what's handed out on this one.